This document supplements the mod_rewrite reference documentation. 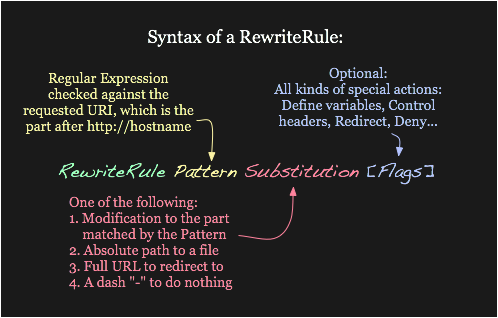 It describes the basic concepts necessary for use of mod_rewrite. Other documents go into greater detail, but this doc should help the beginner get their feet wet. The Apache module mod_rewrite is a very powerful and sophisticated module which provides a way to do URL manipulations. With it, you can do nearly all types of URL rewriting that you may need. It is, however, somewhat complex, and may be intimidating to the beginner. There is also a tendency to treat rewrite rules as magic incantation, using them without actually understanding what they do. This document attempts to give sufficient background so that what follows is understood, rather than just copied blindly. Remember that many common URL-manipulation tasks don't require the full power and complexity of mod_rewrite. For simple tasks, see mod_alias and the documentation on mapping URLs to the filesystem. Finally, before proceeding, be sure to configure mod_rewrite's log level to one of the trace levels using the LogLevel directive. Although this can give an overwhelming amount of information, it is indispensable in debugging problems with mod_rewrite configuration, since it will tell you exactly how each rule is processed. mod_rewrite uses the Perl Compatible Regular Expression vocabulary. In this document, we do not attempt to provide a detailed reference to regular expressions. For that, we recommend the PCRE man pages, the Perl regular expression man page, and Mastering Regular Expressions, by Jeffrey Friedl. In this document, we attempt to provide enough of a regex vocabulary to get you started, without being overwhelming, in the hope that RewriteRules will be scientific formulae, rather than magical incantations. The following are the minimal building blocks you will need, in order to write regular expressions and RewriteRules. They certainly do not represent a complete regular expression vocabulary, but they are a good place to start, and should help you read basic regular expressions, as well as write your own.
. Matches any single character c.t will match cat, cot, cut, etc. * Repeats the previous match zero or more times. a* matches all the same things a+ matches, but will also match an empty string.
? Makes the match optional. colou?r will match color and colour. $ The other anchor, this matches the end of the string. a$ matches a string that ends with a. ( ) Groups several characters into a single unit, and captures a match for use in a backreference. (ab)+ matches ababab - that is, the + applies to the group. For more on backreferences see below. [ ] A character class - matches one of the characters c[uoa]t matches cut, cot or cat. In mod_rewrite the ! character can be used before a regular expression to negate it. This is, a string will be considered to have matched only if it does not match the rest of the expression. One important thing here has to be remembered: Whenever you use parentheses in Pattern or in one of the CondPattern, back-references are internally created which can be used with the strings $N and %N (see below). These are available for creating the Substitution parameter of a RewriteRule or the TestString parameter of a RewriteCond. Captures in the RewriteRule patterns are (counterintuitively) available to all preceding RewriteCond directives, because the RewriteRule expression is evaluated before the individual conditions. Figure 1 shows to which locations the back-references are transferred for expansion as well as illustrating the flow of the RewriteRule, RewriteCond matching. In the next chapters, we will be exploring how to use these back-references, so do not fret if it seems a bit alien to you at first. Figure 1: The back-reference flow through a rule. In this example, a request for /test/1234 would be transformed into /admin.foo?page=test&id=1234&host=admin.example.com. [flags]: options affecting the rewritten request. The Pattern is a regular expression. It is initially (for the first rewrite rule or until a substitution occurs) matched against the URL-path of the incoming request (the part after the hostname but before any question mark indicating the beginning of a query string) or, in per-directory context, against the request's path relative to the directory for which the rule is defined. Once a substitution has occurred, the rules that follow are matched against the substituted value. Figure 2: Syntax of the RewriteRule directive. This maps a request to an arbitrary location on your filesystem, much like the Alias directive. If DocumentRoot is set to /usr/local/apache2/htdocs, then this directive would map requests for http://example.com/foo to the path /usr/local/apache2/htdocs/bar. This tells the client to make a new request for the specified URL. The variable $1 will be replaced with whatever text was matched by the expression inside the parenthesis in the Pattern. For example, a request for http://example.com/product/r14df/view will be mapped to the path /var/web/productdb/r14df. If there is more than one expression in parenthesis, they are available in order in the variables $1, $2, $3, and so on. For more details on the available flags, their meanings, and examples, see the Rewrite Flags document. One or more RewriteCond directives can be used to restrict the types of requests that will be subject to the following RewriteRule. The first argument is a variable describing a characteristic of the request, the second argument is a regular expression that must match the variable, and a third optional argument is a list of flags that modify how the match is evaluated. Notice that the exclamation mark specifies a negative match, so the rule is only applied if the cookie does not contain "go". If the request was for http://example.com/foo/bar, then %1 would contain example.com and $1 would contain foo/bar. 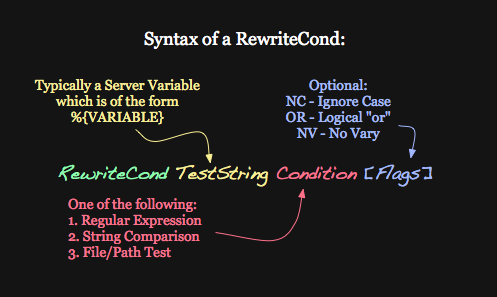 The RewriteMap directive provides a way to call an external function, so to speak, to do your rewriting for you. This is discussed in greater detail in the RewriteMap supplementary documentation. Rewriting is typically configured in the main server configuration setting (outside any <Directory> section) or inside <VirtualHost> containers. This is the easiest way to do rewriting and is recommended. It is possible, however, to do rewriting inside <Directory> sections or .htaccess files at the expense of some additional complexity. This technique is called per-directory rewrites. The main difference with per-server rewrites is that the path prefix of the directory containing the .htaccess file is stripped before matching in the RewriteRule. In addition, the RewriteBase should be used to assure the request is properly mapped.